CASK! continues its informal gatherings for all cask ale lovers to get together and enjoy some cask-conditioned beer. The socials are held on a more or less monthly basis at rotating venues. Check the Front Page for details of the next CASK! Social. Our annual charity beer dinner is back! 2:00pm Bellwood’s Brewery, 124 Ossington Ave. Meet upstairs… we will have a cask of something interesting all to ourselves! 3:30pm Get Well, 1181 Dundas St W.
5:30pm Monarch Tavern, 12 Clinton St.
7:30pm Victory Café, 581 Markham St..
CASK! is holding its annual fundraiser, Beer for a Cure, in support of Prostate Cancer Canada. As a perfect accompaniment to the St. George’s Day festivities, a delicious curry dinner featuring four cask IPAs will be served (see menu below). Celebrate all things English with MC Robert Hughey, guest speaker Nick Pashley, auctioneer Julian Mulock, fancy hats and door prizes. Tickets are $65 per person, which includes a partial donation receipt. Great Lakes Brewery GermEng, Gerglish IPA, hits 6.5 percent abv and 52 IBUs. It’s a hybrid IPA with 50:50 English and German malts, as well as hops. The grist composition contains Maris Otter, Munich and Vienna malt, as well as a blend of crystal and cara malts. The hop blend is Perle and East Kent Goldings, thus more spicy floral versus citrus. Granite Grapefruit Lagoon IPA tops out at 5.5 percent abv and 60 IBUs. It has Citra bittering hops, and Cascade and Citra aroma hops. Amsterdam Boneshaker IPA, dry-hopped, at 7.1 percent abv and 65 IBUs, has Canadian 2-row malt, British pale malt, cara-Munich and toasted wheat flakes. It was continuously hopped with Simcoe and other hop varieties and is finished with Amarillo. Mill Street Paradise IPA from Ottawa, 7 percent abv, features all Cascade hops. Its dry-hopped with Hallertau cone hops grown in the Pontiac region of Quebec. Cask is back at Smokeless Joe. Served every Sunday with a rotating beer/brewery every week, starting at 5:oopm. Cameron’s Cask Night is a casual and intimate event held at the brewery on the last Thursday of each month. Cask Nights are an outlet for Cameron’s brewers to get creative with a different one-off cask brew every month. The brewer leads the evening with a ceremonious tapping of the cask, and there is always some fine local food to enjoy courtesy of the Smokehouse at Whole Foods Market Oakville. For those who have not been to the brewery before, this is a great chance to meet the folks behind the scenes and to tour the Cameron’s facility. For admission details visit Cameron’s Brewery Events and Blog page. Project X is a monthly event at Great Lakes Brewery that will feature a new and limited cask beer only available for the night. All are invited to become a member ($10) and experience these unique and adventurous beers. Entry to each monthly event will include samples of the monthly cask conditioned beer, 2 drink tickets, and beer-themed food. Admission is only $10, and requires a membership. All members will receive an exclusive t-shirt and membership card. Great Lakes staff will be on hand to tour, taste, and talk about the world of beer. For details visit Great Lakes Brewery Events Page. Cask Days 2011 Seminars in Collaboration with CASK! Both events will be held on Saturday, October 29th, 2011 @ barVolo (587 Yonge Street, Toronto) and are presented by: Cask Days in collaboration with CASK! The seminar sessions will begin at 10:30am (details on each session below), with the CASK! Social running from 3:00 – 7:00pm. Seminar admission costs are $10 per session, or $25 for all. This includes one glass of cask-ale per session plus seminar discussion. As usual, there is no admission charge for the CASK! Social. An in-depth discussion of how to properly make and rack cask conditioned ale. The seminar will educate brewers and beer enthusiasts on the essential steps involved when brewing cask ale. Charles MacLean has been at the forefront of cask ale in Ontario since the beginning and will elaborate on the advantages and disadvantages of brewing cask ale at a brewery level. Cellarmanship in the broadest sense covers the gamut of drinks sold by retail outlets and requires a detailed technical manual. The purpose of this seminar is to set out the general principles for the successful management of cask conditioned ales at the restaurant/bar level. Ralph Morana and George Milbrandt have established themselves within the beer community as bar owners that advocate cask condition ales and serve them on a daily basis. 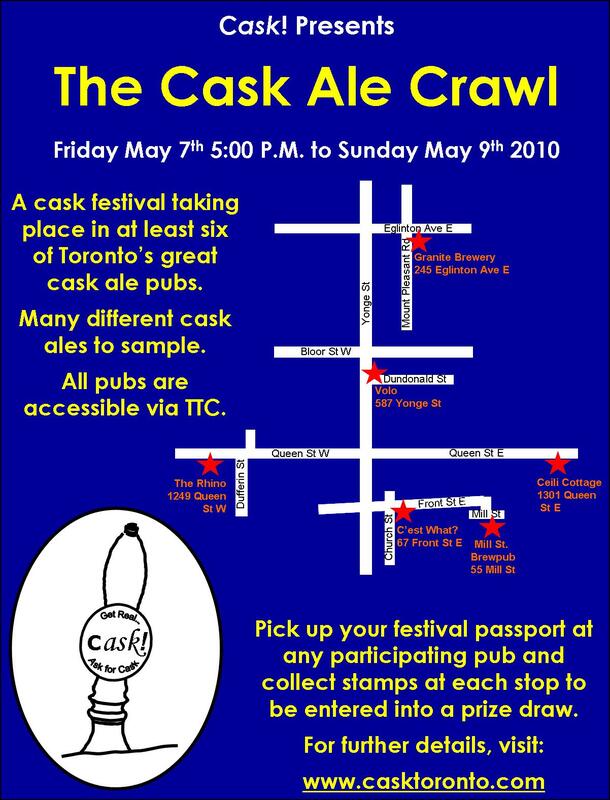 Learn about the history of Cask Ale in Ontario and find out how it has matured to where it is today. Nick Pashley and Robert Hughey are both highly dedicated to raising the awareness of local cask ale and offer a wide range of brewing knowledge and experience from which to draw. Nick Pashley is the author of “Notes on a Beermat: Drinking and Why It’s Necessary” and “Cheers: An Intemperate History of Beer in Canada”; and Robert Hughey regularly contributes to the “The New Brewer” and “Great Lakes Brewing News” beer publications. barVolo will host this month’s CASK! Social – the event is open to the public with no admission fee. This will be an exclusive House Ales feature of Traditional English Styles – all beers are subject to availability. Cask Ale Showcase: Robert Hughey features three new hop-charged cask ales, designed by him and brewed at Niagara College Teaching Brewery, paired with food. CASK! Social: This month’s Social is held in special recognition of the Granite Brewery which has been serving cask ales in Toronto for 20 years. Cask Jam: The Dominion on Queen will be launching permanent cask ale! Live grooves, local cask brews & finger food available. Casks, Kegs, Bottles or Cans? Discover for yourself the ideal beer container. Ten samples will be compared. Rhino Harvest Beer Festival: Featuring Adventures of the Gourd with Bill White guiding you through a tasting of harvest seasonal beers, including pumpkin ales on cask and draft. Black Oak Tap Takeover: 15 Black Oak beers will be available including 4 cask ales. Kensington Cask Night: Kensington Brewery will be tapping a cask of their IPA and/or Augusta Ale. Great Lakes Presents Jerry Leger and the Situation: and will be bringing a cask of something special. Volo House Ales Tap Takeover: Featuring 16 of Volo’s House Ales, including cask ales, some of which are collaborations with local brewers. Great Lakes Harvest Festival: 2nd annual Harvest Festival at Great Lakes Brewery, with live entertainment, seasonal and one-off cask and draft beers, plus a farmers market. Friday June 17th 5:00 pm – Sunday June 19th 2011. This year’s Cask Ale Crawl promises to be even better than previous years, with new pubs joining in. There are ten pubs in all for you to visit as advertized below. No fixed schedule, just show up at any of the pubs in any order and enjoy some fine cask ales. Pick up a passport and get stamped to be entered into the prize draw. The draw will take place at our next Cask! Social and winners not present will be notified by e-mail. 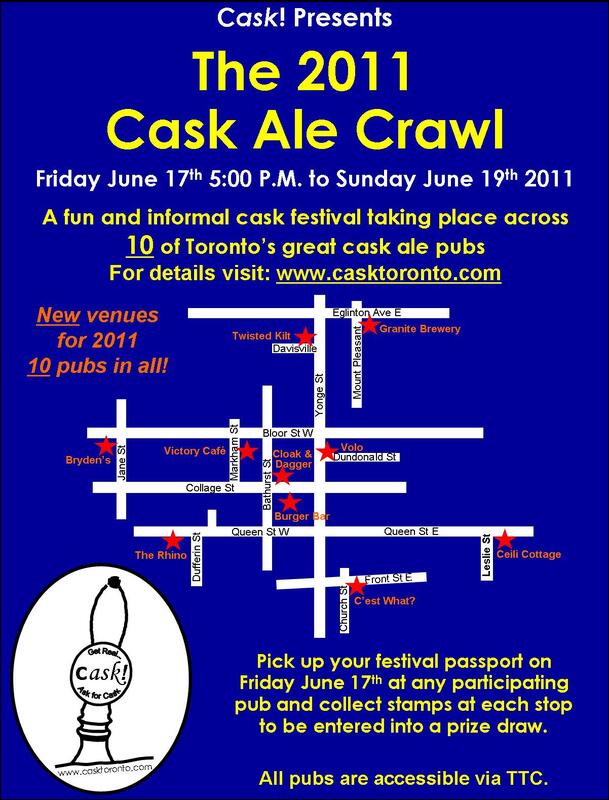 Come join us and meet new friends at this year’s Cask Ale Crawl! September 20th – 26th 2010. Pick up a passport at any of the participating pubs. Have your passport stamped at each pub to be entered into the prize draw. See poster for details. Details of the cask ales that will be available will be posted shortly. Hope to see you on the crawl! This gourmet four course cask ale dinner celebrates St. George’s Day charity and is in support of Prostate Cancer Canada. Join us and your fellow cask ale fans for a special evening with guest speaker, silent auction, door prizes, delicious food, and fine cask conditioned ales. See Poster for further details. Volo will be hosting a series of tasting events to find Ontario’s best cask IPA or Pale Ale. The first three rounds took place in April, May & June, with attendees voting on their favourites. From 18 entries, the competition is now down to two – Durham Hop Addict and Mike Duggan Number 9 – which will be going head-to-head. Both beers will be available in a blind tasting, and once the votes are tallied, the champion Cask IPA in the province will be crowned. Continuing the theme of the Victory’s previous cask festivals, this event is a celebration of local traditional cask conditioned ales and aims to introduce new people to these wonderful beers. There will be sixteen cask ales on offer, all from local brewers. Two casks each of the most popular ales will be available to better ensure that everyone has a chance to enjoy them. The full list of beers will be announced at a later date. Beer samples will be offered by the half-pint measure, purchased with a beer ticket available at the festival. A selection of tasty food will also be available with the purchase of a food ticket.